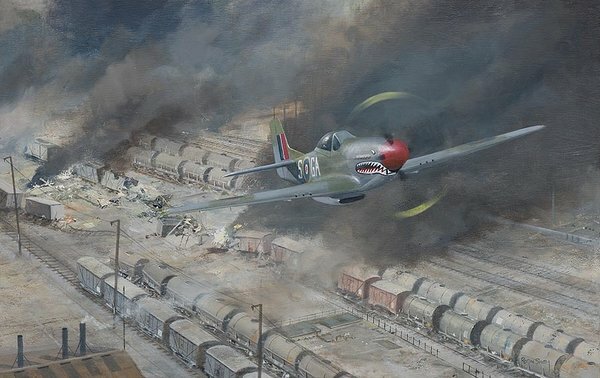 A P51 Mustang IV of 112 Sqn goes in for the final attack during the destruction of an Italian rail yard in early 1945. These made good targets as there was just so much to have a go at to mess things up... tracks, rolling stock, locomotives etc. The painting shows S-GA during one of these attacks. In mid 1940, the entry of Italy into the war, saw 112Sqn brought up to strength starting with Gladiators, but having made good use of the Tomahawk, then Kittyhawk, ended the war with the P51 Mustang.